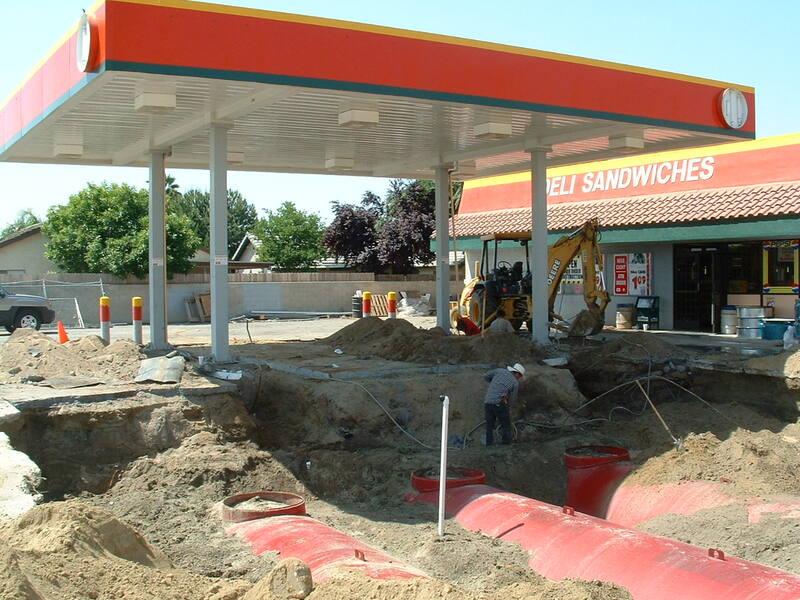 Fast Lane Mini-Mart is a convenience store and retail fuel supplier located in McFarland California. Soil samples were taken at the site during an Underground Storage Tank (UST) replacement in 2004. Fuel hydrocarbons were detected in these samples, indicating an unauthorized fuel leak had occurred from either the tanks, dispensers, product lines or some combination of these. Based on this data and groundwater monitoring data that followed, E2C recommended the installation of several monitoring wells and soil borings in order to delineate the extent of contamination. In 2008, E2C directed the installation of the proposed wells. The resulting data from the installed wells revealed that fuel hydrocarbons had impacted soil and groundwater 55 feet below ground surface (bgs). Later that same year, E2C commenced a pilot test for a remediation system consisting of soil vapor extraction combined with groundwater air sparging. The results of this pilot test were promising, and full-scale remediation at the site commenced in 2010 and continued through early 2013. It is estimated that over 21,000 lbs of fuel hydrocarbons were removed from the site during this time. The remediation system was stopped in 2013 because hydrocarbon removal rates had decreased drastically from over 200 lbs/day in 2010 to approximately 5 lbs/day in 2013. The State Water Board agreed with E2C’s recommendation that further use of the remediation system would be unnecessary in 2013, at which point the system was shut down. A soil vapor survey and health risk assessment were conducted following the shutdown of the remediation system, both of which determined that residual contamination in the soil posed little to no health risk to humans or the environment. A closure letter from the State Water Board from July 2015 officially marked the end of remedial activities due to the efforts of E2C.